Now in a new full–color edition, Fundamentals of Photonics, Second Edition is a self–contained and up–to–date introductory–level textbook that thoroughly surveys this rapidly expanding area of engineering and applied physics. Featuring a logical blend of theory and applications, coverage includes detailed accounts of the primary theories of light, including ray optics, wave optics, electromagnetic optics, and photon optics, as well as the interaction of photons and atoms, and semiconductor optics. Presented at increasing levels of complexity, preliminary sections build toward more advanced topics, such as Fourier optics and holography, guided–wave and fiber optics, semiconductor sources and detectors, electro–optic and acousto–optic devices, nonlinear optical devices, optical interconnects and switches, and optical fiber communications. Each of the twenty–two chapters of the first edition has been thoroughly updated. 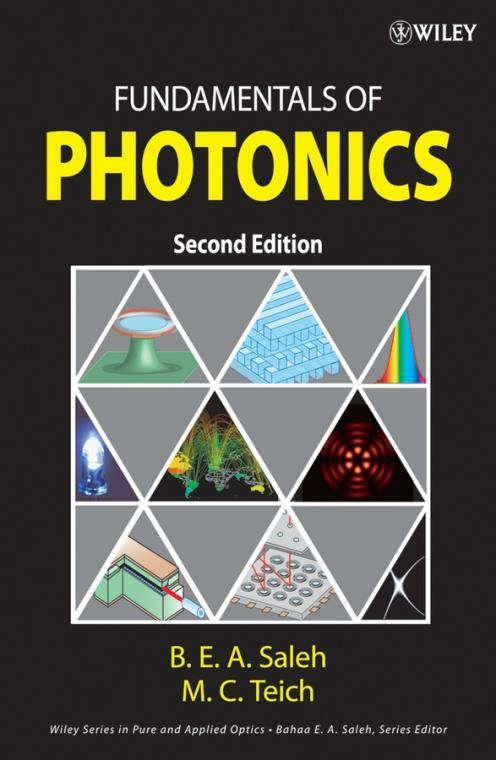 The Second Edition also features entirely new chapters on photonic–crystal optics (including multilayer and periodic media, waveguides, holey fibers, and resonators) and ultrafast optics (including femtosecond optical pulses, ultrafast nonlinear optics, and optical solitons). The chapters on optical interconnects and switches and optical fiber communications have been completely rewritten to accommodate current technology.